When we have come to that point in a pet's life where we are faced with the difficult decision of either allowing him to go on with a poor quality of life or ending his life to end his suffering, the decision is never an easy one, and it often brings a lot of guilt with it. Importantly,and right now, we should absolve ourselves of any guilt we may be feeling for making this decision. Many of us seem to think we are“killing” our pets when we do this. Nothing could be further from the truth. Whatever disease our pet has is what is killing them, and it doesn't need any help from us. All we are doing by making this decision is ending the pain or discomfort caused by the disease. When unrelenting pain or discomfort are the only realities left for a pet, there is no point in allowing his life to continue. Sometimes,the guilt arises because of financial considerations. The bottom line of it is this. We have to live in the land of reality. Few of us are made of money and,therefore, money has to play a fairly big role in the medical decisions we make concerning our pets. If we can't afford to provide the care they need, then we simply cannot afford it and this realization should not cause us to feel guilt. Life is what it is, and so even if we cannot treat our pets as we would like to be able to do,then neither should we allow them to suffer for want of treatment. Very often when the choices are between medical diagnosis and treatment or euthanasia,we will support you in whatever reasonable choice you make. The only wrong thing to do is to do nothing. Euthanasia is the best and last thing we can do to help our pets when they are beyond help. To try to make this as smooth for you as we can, we want to take some of the mystery out of it by letting you know what to expect. As we said above we will support you in whatever reasonable decisions you make for your pet. However, please understand that as hard as a euthanasia decision is for you to make, it is also difficult for us to carry out even if it is in the pet's best interest. Taking life is never easy for us, and it takes its toll on us. So, we ask your understanding in our establishment of this policy. The policy of Friendship Springs Veterinary Care is this: we will NOT euthanize animals that are considered to be healthy regardless of reason with the exception of animals deemed to be dangerous as determined at our sole and professional discretion. This policy is not subject to negotiation. There are a couple of things to think about regarding before you arrive so you don't pressure yourself into making a decision that you may come to regret later. Bear in mind, you can always change your mind at any point. Do you want to be present and if so for how long? Every one has to decide this for themselves, and there is no right or wrong to this. Some will choose to stay through the whole procedure, some will choose to stay only through the sedation part of the procedure, and some will not stay at all. Whatever you decide to do is very personal and no one here will judge you for your choice. We are here to be as supporting of you as we can in this difficult time. .Communal cremation in which your pet would be cremated with other pets that have passed on. You would not be able to get your pet's ashes back with this choice. .Private cremation can also be selected. In this instance your pet would be cremated individually and the ashes would be returned to you within a few days. With this option the ashes are returned in a decorative tin which is what most people choose to do. We have some samples you may see. Alternatively, with private cremation , there is a wider selection of urns, boxes, plaques and markers from which to choose if you wish. We have their catalog for you to see if you choose to do this. .Another choice is private burial in a pet cemetery, Pet Haven Memorial Park. This is a cemetery you may visit if you wish. .Home burial is an option if you have a place you wish to bury your friend on your own property. This may be subject to legal restrictions, so it is best for you to check with local ordinances first if this is what you wish to do. .We understand that this is a difficult decision to make. If you need us to hold your pet's body for a reasonable period of time until you decide,we can make this arrangement as well. .Finally, if you wish to have something else done, please let us know and we will help you however we are able. For your privacy,and if its not an emergency, we will try to schedule the euthanasia visit for you at a time when we don't have many other clients in the hospital. If this is not good for you, please let us know and we will try to accommodate your schedule as much as we can. We will often ask you to come around to the back of the building so you may enter through the back door. This is to allow you as much privacy as we can by not having you come in through the waiting room which is often busy. It is helpful if you will call us from a cellphone when you arrive so we will know to look for you at the backdoor. If you would rather not come through the rear entrance, please let us know. Once you arrive,if you need help bringing your pet inside, we will be happy to assist you with this. You and your pet will be conducted to one of the examination rooms. At this time if you have any questions for the doctor or need him to examine your pet before proceeding, just let us know and we will accommodate this request. After any examination or consultation are completed, if no changes to the euthanasia plan are needed, then we will get clerical work out of the way. You will be asked to sign a one page consent form in three parts. The first part is your request for us to perform euthanasia for your pet. This part also asks for your affirmation that your pet has not bitten anyone in the preceding ten days. If your pet has bitten someone during this time,please let us know as this changes how we do things significantly. It is a matter of legality and public health concern. The second part asks if you wish to have an autopsy done. We completely understand if you choose not to do this. However, we do highly recommend this if there is any question as to the cause of death, especially if any legal issues might arise. There maybe additional fees for this. Depending on circumstances we can often provide this service, or we may need to refer you to a pathologist. Again, let us know if this is something you would wish done. The third part asks what you wish to do with your pet's remains after he has passed on (see below). We will also ask you for payment at this time. If you have any questions about our payment policy, please ask us in advance so as to avoid any undue stress for your self in what is likely to be a stressful event under the best of circumstances. Please let us know at this time if you have decided to stay for the whole procedure,part of the procedure, or none of the procedure. Again,you are not required to stay. Some people choose to stay and others choose to leave. It is a very personal choice and there is no right or wrong to it. When all clerical work has been completed, we will begin the actual procedures leading to euthanasia. We will begin by giving your pet a heavy sedative. The goal of sedation is to reduce their anxiety and any pain they may be feeling because of their disease so they won't care about anything else going on. This is given by subcutaneous injection (under the skin). This medication will sting just a little. 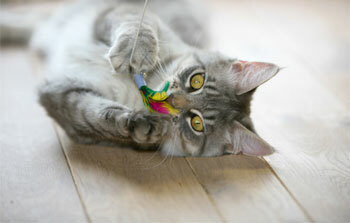 Some pets act as if they hardly notice, but others may flinch or cry just a little, about like a penicillin shot. However, it only hurts for a moment; and it will not continue to hurt after its over. We cannot allow you to hold your pet or touch him while we are giving this injection,but once the injection is done, you may resume holding or petting him. After it has been given, we generally allow five to fifteen minutes for the medications to reach their maximal effect. This can be a near-anesthetic level or it may be simply a quieter,calmer state. Because every pet is different we cannot always predict how any one pet will react to the medications. The most common thing that we see is a pet who doesn't get as sedate as we would like. In these unusual cases we simply give more medication. Other adverse effects that are very rarely reported may include nausea or vomiting or longer duration of stinging following the injection. Again, we would stress that this is very rare. Occasionally in pets that are very sick or debilitated already,the sedation injection may actually serve as the euthanasia injection. This isn't harmful or painful; it's just a sign of how sick they were. With pets that have significant respiratory symptoms, we may have to proceed with euthanasia before sedation has reached its peak effect or change our procedure because as they begin to relax from the sedative,sometimes breathing can become more difficult. Other unpredictable side effects may occur but these would be extremely rare and consequently unpredictable. Once sedation has set in maximally, we will often shave a small patch of fur over a vein to make it easier to see and feel. This increases our chances of hitting the vein quickly and cleanly for the intravenously-administered euthanasia injection. Most frequently we will use a vein in one of the back legs, but occasionally we will use a forelimb. If the veins are weak, difficult to find, poorly distended from disease and such, then we may use a tourniquet to help raise the vein adequately. This is not painful. When the vein to be used has been isolated, we begin the injection intravenously. The only pain that will be felt, if any is felt at all,will be the needle stick itself. With the sedation on board,many pets never notice at all. We often use a device called a butterfly catheter for the injection. This is basically a hypodermic needle attached to a small tube that in turn attaches to the syringe. It allows us to avoid moving your pet any more than is absolutely necessary and it also allows us to permit you to keep touching your pet if you wish while we proceed with the injection. Once we start the injection it works very quickly. The medication we use for this is primarily pentobarbital which was for a long time used as an anesthetic medication before we had better drugs. So, when we say “put to sleep,” that is exactly what happens. We are literally administering an overdose of anesthetic medication. If the pet is not already anesthetized from the sedation when we start the injection, then complete anesthesia will occur usually within fifteen to thirty seconds of the start. Death is never nice no matter how quickly, peacefully, and smoothly it goes. Eyes seldom ever close as they pass away. The most common other thing to be seen is a deep, sighing breath right before all breathing stops. Unusually, urine or feces may be passed. Rarely,will other things be seen, such as reflexive movements, muscle twitching,or vocalization. It is important to be aware of the possibility, because these things can cause us great distress if we aren't expecting them. The important thing to remember is that should these things happen,your pet will be well beyond being aware of them and they won't be painful. When it is finally over, you may stay for a short period of time to finish saying goodbye to your pet. We know this will be very difficult for you, we have all been through this ourselves, so if there is anything you need from us, please let us know at any time. Meets every Wednesday night from 6:30 to 8:00. Free of charge. Participants are encouraged to return to some meetings to help others after they feel their needs have been met. Dr. Cutchin has known some of the staff of Pet Angel for almost twenty years, has had dealings with these same individuals while working at several different hospitals during this time, including Friendship Springs Veterinary Care, and he has never had any problems with them at any time. Following euthanasia or death of a pet if the owner has selected private cremation for care of the pet's remains, these pets are are identified with a special tag by our hospital at the time of euthanasia. Upon arrival a the crematory, these pets are kept separate from those pets intended for communal cremation. They are registered into a log, then everything is double-checked using the invoice duplicate given us at the time of transfer, identification tag,and log. Pets are cremated individually and then the ashes are placed in the chosen container, given a cremation certificate, and then returned to us. The identification tag remains with the pet right up to the point that the ashes are returned to the clinic. This ensures proper identification at all phases of the process. For those pets for which communal cremation has been selected, rest assured that these remains are likewise handled with great respect and care. Following cremation with other pets their ashes are spread in the pet cemetery.